Other Types of Injuries | Miami Accident Lawyers Gerson & Schwartz, P.A. Contact Coral Gables Personal Injury Lawyer Gerson & Schwartz, P.A. Gerson & Schwartz P.A. is recognized within the legal community for providing valuable and beneficial service to our clients. We continue our 46th year plus tradition of representing serious injury victims and their families throughout Miami Dade, Fort Lauderdale, Coral Gables, and other areas of South Florida. Our law firm has extensive experience representing clients injured in automobile and truck accidents, motorcycle crashes, boating, marine, slip and falls and violent crime cases. If you have been severely hurt or have lost a loved one because of the negligent, reckless, or intentionally wrongful act of another, you may be entitled to recover financial compensation for your losses. We are experienced Miami personal injury attorneys, resourceful advocates and aggressive litigators for clients seeking to recover damages for the full extent of their losses from negligent individuals, business operators and corporations. Every year, thousands of people in the Miami area are seriously injured in accidents that are caused solely because of the carelessness or recklessness of someone else. Injuries and accidents can take many forms from car and motor vehicle accidents to premises liability and wrongful death claims. These accidents can include car accidents, slip and falls, truck accidents, pedestrian accidents, and other incidents that have the potential to leave victims with injuries that can affect them for years to come. And because places like Miami, Boca Raton, Homestead, Fort Lauderdale and the Florida Keys are surrounded by water, maritime accidents are also frequent cases of personal injury throughout South Florida. At Gerson & Schwartz, our lawyers regularly work with people who have sustained serious and life changing injuries, including those described below. Traumatic brain injuries, or "TBIs," can occur in any type of accident that has the potential to cause head trauma. In fact, they can happen even in the absence of a bump or blow if a person's head snaps back and forth on the neck with enough force to cause the brain to hit against the inside of the skull. The most common form of mild TBI is a concussion, which is a serious injury that could result in symptoms that last for months or weeks - including headaches, sensitivity to light and sound, dizziness, trouble sleeping, memory problems, and others that can significantly interfere with a person's daily life. In more serious cases, victims can develop physical or cognitive disabilities that prevent them from working or living without medical assistance. Spinal cord injuries often affect victims for the rest of their lives. They often happen in serious bicycle accidents, motorcycle accidents, pool accidents, or other accidents where there is a high risk of serious trauma to the head, neck, or back. When the nerves of the spinal cord are damaged, it can be difficult or even impossible for the brain to communicate with the rest of the body. As a result, spinal cord injuries can result in loss of range of motion, numbness, pain, sensations of pins and needles, and even paralysis below the point of injury. Serious burns can happen in a wide variety of accidents, including motor vehicle accidents, workplace accidents, explosions, fires, and electrical accidents. In serious cases, victims can be left with disfiguring injuries and permanent scarring that can significantly affect their appearance and physical ability. Soft tissue injuries encompass a wide variety of injuries, including sprains, strains, lacerations, and contusions. While these injuries are often minor, they can also be extremely serious and may even require emergency medical treatment such as surgery to correct. They can happen in virtually any type of accident involving physical injury. While these types of injuries tend to heal on their own, they can often entitle victims to significant compensation. The financial compensation amounts that injury victims are legally entitled to recover are referred to as "damages." The type of damages accident victims may recover depends on a number of factors. They include where the accident occurred to the type of case or injury claim is being made. Damages are further classified into "economic" and "non-economic" losses. Economic damages are more easily quantified because they include compensation for medical bills and medical related expenses such as medical treatment, future care, and compensation for loss of earning capacity and other out of pocket expenses. "Non-economic" damages are comprised of compensation for pain and suffering, scarring, disfigurement, disability, emotional/ psychological harm, and the loss of capacity to enjoy life. In some cases, punitive damages may also be recoverable. However, the legal standard to establish entitlement to such an award is much greater and requires evidence of gross negligence or the reckless disregard for the life and safety of others. Has it happened before to other people? Should the defendant have known of the risk to you and done something to lower it or make it safer? At Gerson & Schwartz PA, we have been representing accident victims and their families in South Florida since 1970. 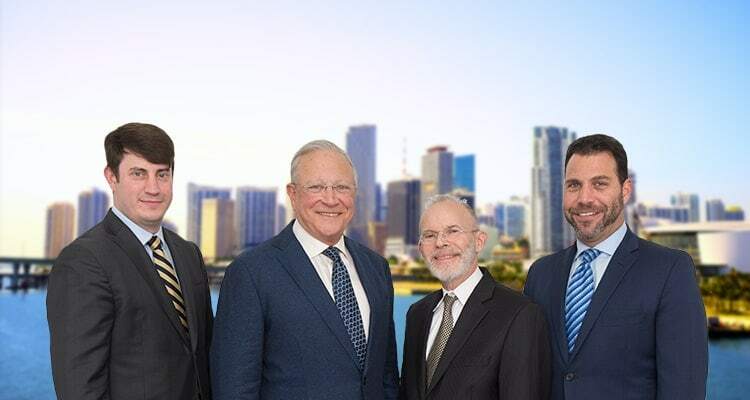 Our attorneys Philip M. Gerson, Nicholas I. Gerson, and Edward S. Schwartz are recognized in the legal community for effective and aggressive legal representation. All partners are honors graduates of the University of Miami Law School and were members of the Law Review. Our senior partner is a board certified civil trial attorney with extensive jury trial and appellate experience in all Florida state and many federal courts. Our firm has a proven track record of successful trial and settlement outcomes, some of which can be found in on our past case results page. Our work in the appellate courts has established important legal precedents, in which some cases have changed the law and become landmark decisions. Our commitment to our clients is that we fight ethically until the very end, and we won't recommend settling a case unless it's fair and just. If you need experienced legal representation we encourage you to contact our firm. Gerson & Schwartz, P.A. has been serving accident and injury victims for over 46 years. Our law offices are located minutes from downtown Miami. And, all inquiries are handled promptly by our attorneys. Call us to talk confidentially about your case. There is no fee unless we are retained and recover money for you. We will answer your questions about the laws applicable to your case. You may contact us by calling (305) 371-6000, via email at info@gslawusa.com or by simply using the contact form. The South Florida personal injury lawyers of Gerson & Schwartz P.A. represent accident victims and their families throughout Miami Dade, Miami Beach, the Florida Keys, Fort Lauderdale, Broward, and West Palm Beach. Our law offices are conveniently located near downtown Miami. However, as needed, our attorneys and investigators can visit you at home or in the hospital. We also answer questions from anywhere in the world. Call us toll free at (877) 475-2905 or contact us online to schedule your free case consultation. Se Habla Español.